The Foreign Office of the United Kingdom has just acquired a rescue cat to patrol its aged halls, which apparently have a bit of a rodent problem. His name is Palmerston, after nineteenth-century foreign secretary Henry John Temple, 3rd Viscount Palmerston. “Palmerston is HM Diplomatic Service’s newest arrival and in the role of FCO Chief Mouser will assist our pest controllers in keeping down the number of mice in our King Charles Street building. “Palmerston’s domestic posting will have zero cost to the public purrse as a staff kitty will be used to pay for him and all aspects of his welfur. “Palmerston, a two-year-old domestic short hair, was found wandering around the streets of London underweight, hungry and with no microchip,” reports Sky News. He was adopted from the Battersea Dogs and Cats Home. Palmerston joins Larry, who lives at 10 Downing Street and is vastly more charming than his owner, David Cameron. (Larry likes Obama.) 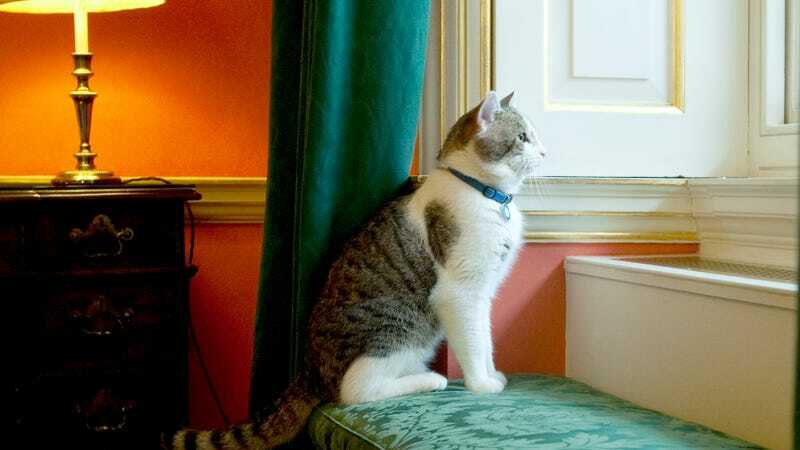 Previously, the Foreign Office received regular visits from Freya, who belongs to Chancellor George Osborne and therefore resided nearby, at 11 Downing Street. But she kept getting into trouble and had to be removed to the countryside. Palmerston is a very good cat. I give Palmerston four and three-quarter stars out of a possible five stars.